This 100% biodegradable shower gel is sulphate, paraben and colourant-free. Contains real pear and lemongrass extracts. Aqua (Solvent/Diluent), Sodium Lauroyl Methyl Isethionate (Surfactant - Cleansing Agent), Cocamidopropyl Betaine (Surfactant), Sodium Chloride (Viscosity Modifier), Glycerin (Humectant), Polyglyceryl-4 Caprate (Skin-Conditioning Agent), Parfum (Fragrance), Sodium Benzoate (Preservative), Citric Acid (pH Adjuster), Sucrose Laurate (Skin-Conditioning Agent), Trisodium Ethylenediamine Disuccinate (Chelating Agent), Zinc Laurate (Anticaking Agent), Linalool (Fragrance Ingredient), Salicylic Acid (Preservative/Hair Conditioner), Aloe Barbadensis Leaf Juice (Skin Conditioning Agent), Helianthus Annuus Seed Oil (Emollient), Pyrus Communis Fruit Extract (Skin-Conditioning Agent), Sodium Hydroxide (pH Adjuster), Carica Papaya Fruit Extract (Skin-Conditioning Agent), Cymbopogon Schoenanthus Extract (Skin-Conditioning Agent), Panax Ginseng Root Extract (Natural Additive). Easy to use, good scent. 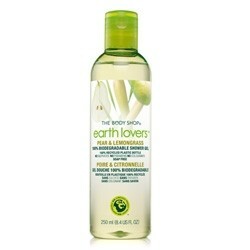 Another great shower gel from the Earth Lovers range at the body shop. The scent is succulent and juicy, richness from the pear is striking against the tangy lemongrass. Perfect for summer as it is almost cooling and very refreshing! "The Earth Lovers range are 100% biodegradable and sulphate, paraben and colourant-free. This is an excellent product if you really care about the environment and..."